If you sometimes enjoy making authentic Chinese food at home, nothing will open doors for you as much as being able to use original-language recipes. 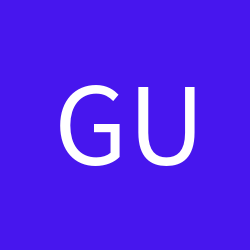 It's not difficult, and if you are on a practical Chinese language learning path, it might be time to give it a try. With that in mind, let me take you through this simple dish I made yesterday here in Kunming, using it as a chance to give you a little insight into recipe language. Made this for a Chinese friend who is not an adventurous eater; we had it for lunch. 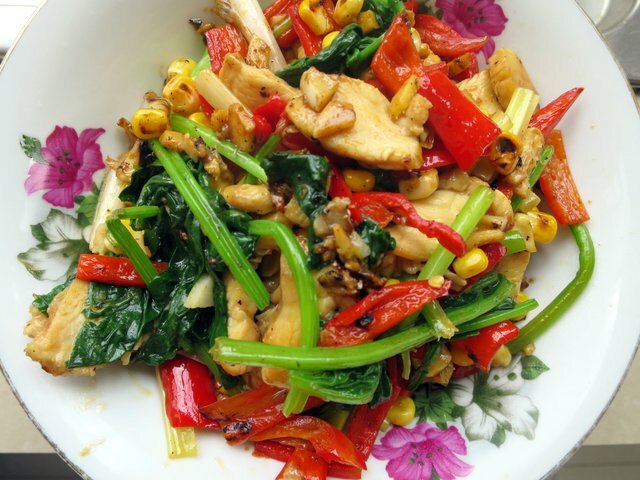 It's a safe and easy dish even if you're not used to cooking Chinese food. No tricks and no surprises; yet it came out pretty tasty. 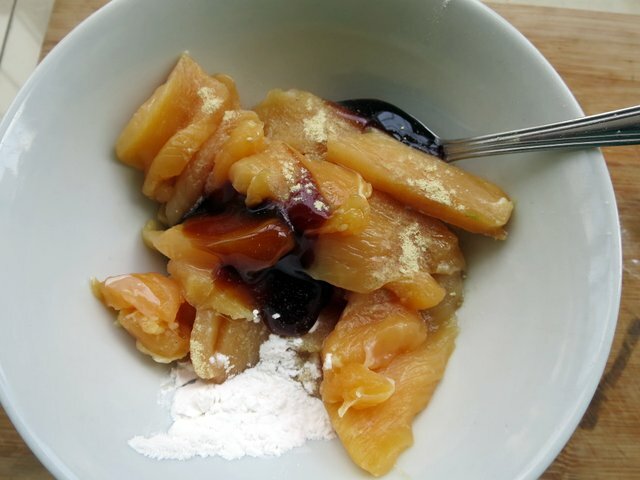 Recipes that one finds on internet cooking sites here are often graded as to difficulty 难点/难度。This one would have to be a 初级，primary grade, since it doesn't call for any specialized equipment or techniques. Furthermore, the ingredients are not exotic or difficult to find. Let's take a look so you can see for yourself. 用料 means ingredients, also given as 菜料 or 材料。The ingredients are usually divided into 主料 which means main ingredients, and 辅料 which are supplementary ingredients, plus 调料 broadly meaning seasonings. This division is sometimes kind of fuzzy and doesn’t always neatly follow western logic. It's also not uncommon to find things omitted in this initial list that are later called for in the instructions. 适量 is a frequent phrase, which simply means "an appropriate amount." So you can use a little or a lot depending on your preferences and those of your guests. 葱 = spring onions, 大蒜 = garlic, 姜 = ginger, 食盐 = salt, and 蚝油 = oyster sauce. In this particular recipe, the 主料 are corn 玉米 and chicken 鸡肉 。Chinese recipes usually give ingredients by weight instead of by volume. Unless you have a kitchen scale, and I don’t right now, this means you need to work by eye. (A cooking scale is inexpensive on Taobao, and is probably a sensible investment, especially when starting out.) Here I used one large chicken breast and about a cup of corn. 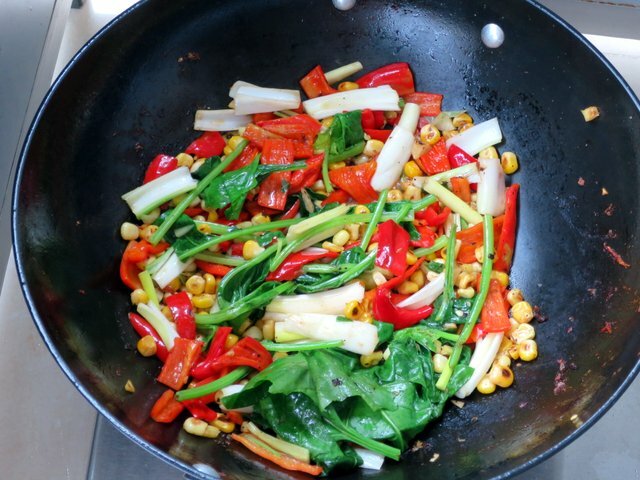 The corn you need for this dish is corn kernels 玉米粒 instead of corn on the cob 玉米棒。You can either buy the corn kernels as such in the wet market, freshly shucked, or you can buy corn on the cob and strip the kernels yourself with a paring knife. 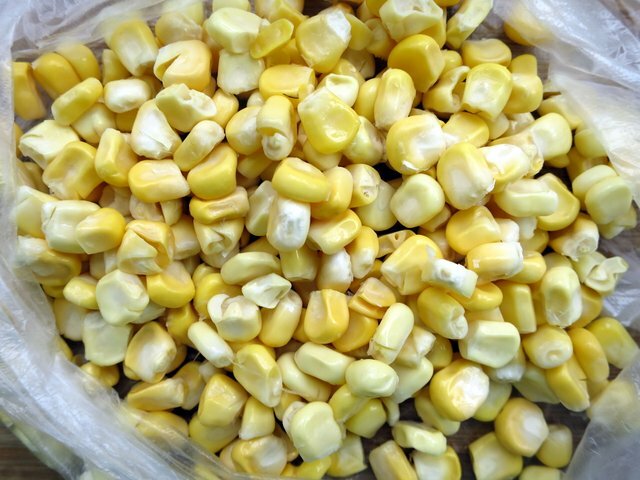 When buying corn, look for a uniform rich golden yellow color and ears of corn that are not too large, since corn picked young tends to be more tender. Chicken leg is dark meat, moist with a bit more flavor, but it takes an additional step to remove it from the bone. 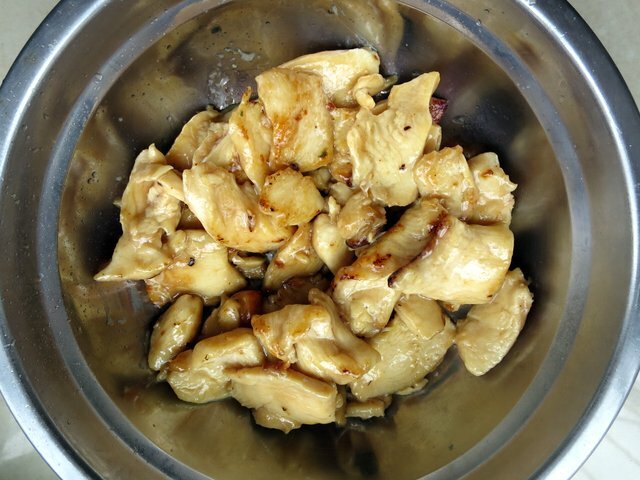 Chicken breast, white meat, is easy to cut up, but can easily become dry and tough if cooked too long. 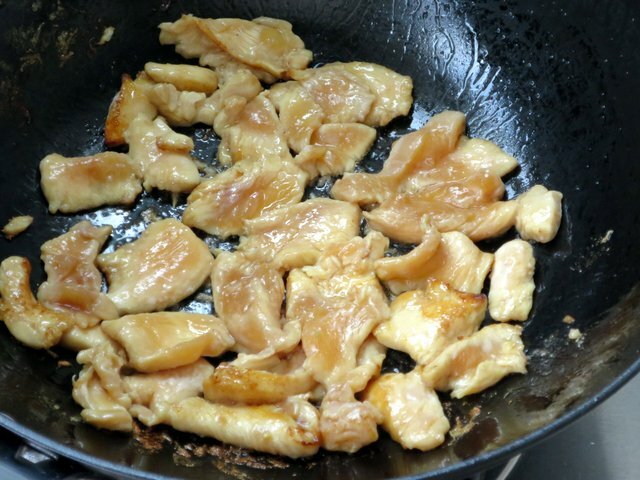 I had chicken breast on hand, and so that’s what I used yesterday. Convenience is a trump card if you’re just preparing a casual meal for a friend and not polishing your Michelin star. 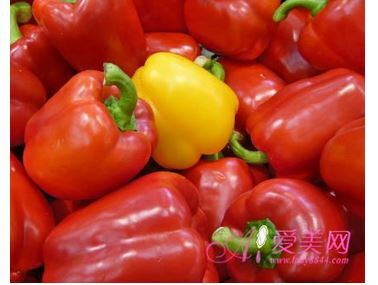 Here's a picture of the 辅料, the peppers. These 红尖椒 are quite mild, with only a little bit of bite. 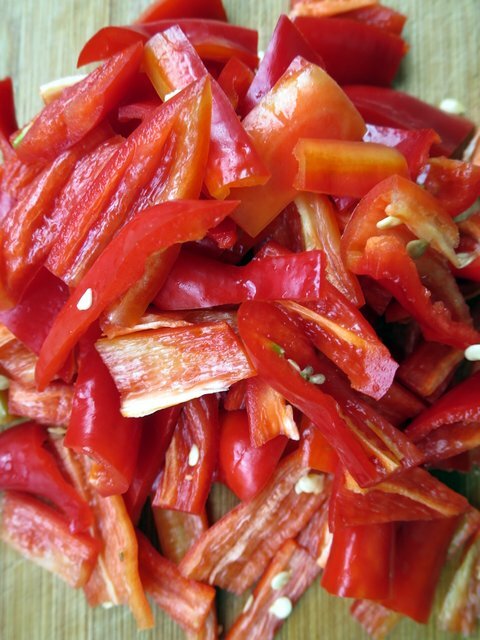 When I cut them up, I discarded most of the seeds; had I left more seeds, the dish would have been spicier. Now moving on to the 做法 or method, sometimes also written as 步骤 or steps, we quickly see that it has two parts, the prep and the actual frying. Let's look first at the way we need to pre-treat the chicken. I sliced it into thin strips = 鸡肉切片。 Could have just as well cut it into small cubes = 鸡肉切丁。Next we marinate it briefly to help it cook fast and give it extra flavor. 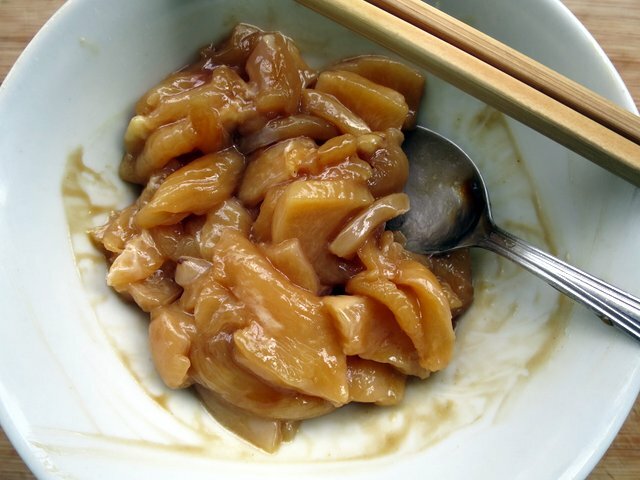 腌 means to marinate; it can also mean to brine or to pickle. While the chicken was marinating, I minced some garlic and ginger 切细蒜姜 and cut a scallion into one-centimeter sections 切段葱。Then washed and cut up the vegetables 洗好后，切片蔬菜。I had some left over spinach 菠菜 in the fridge, so I added it as well. 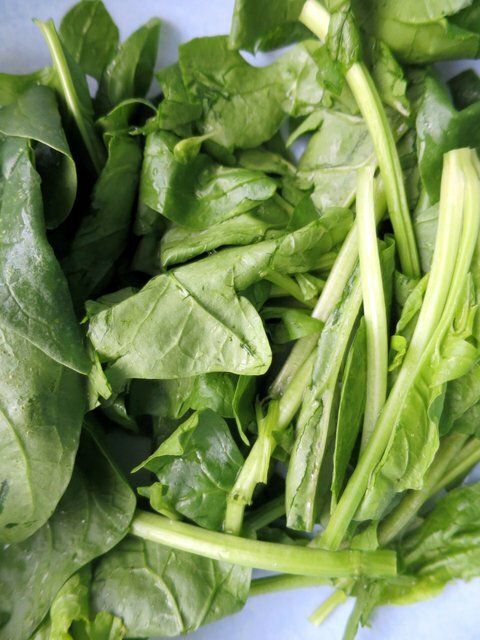 Could have used 韭菜 (garlic chives) instead of spinach. I mainly wanted some dark green in the finished dish so it would look attractive. Never hurts to think about eye appeal: we now have three bold colors, as you see below. Ready now to fire up the wok. I started some rice at the very beginning, and didn't light the fire on the stove until the rice was ready. Nothing worse than having everyone stand around while your main dish get cold and the rice takes an eternity to finish. 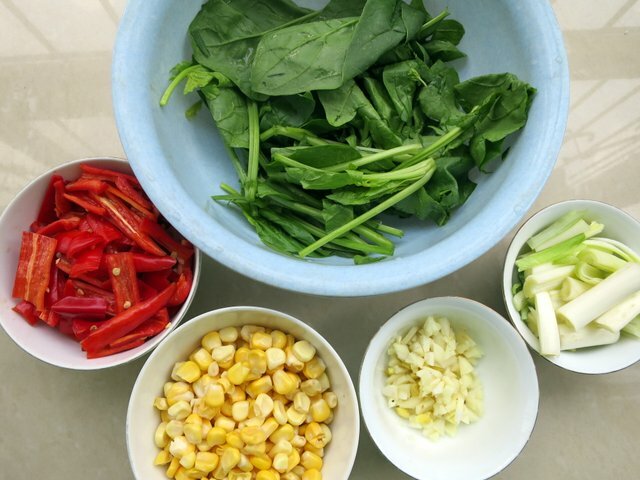 Now give the peppers a slight head start, following with the corn, and last of all the spinach and scallions. 先炒红尖椒，然后放玉米、菠菜、葱、调料。Here’s what it looks like at that stage. 加鸡肉、快拌好、少量盐、出锅。Add back the chicken, quickly mix it up adding a sprinkle ("a tiny bit" = 少量) of salt, scoop it out of the wok into a serving dish. 装盘出锅。This phase shouldn’t take more than 20 or 30 seconds; it’s just to combine flavors and be sure the chicken pieces are thoroughly reheated. Steamed rice on the side. Chinese recipes often have a sentence or two at the end which is a hint or tip to make the dish come out better. It's written as 小贴士。Maybe, for example, "Remember to slice the meat thin so it will cook fast." But here today I've included those "footnote" type comments in the main text as we went along. Thanks, Skylee. Went back and made the appropriate corrections. Appreciate your kind help! 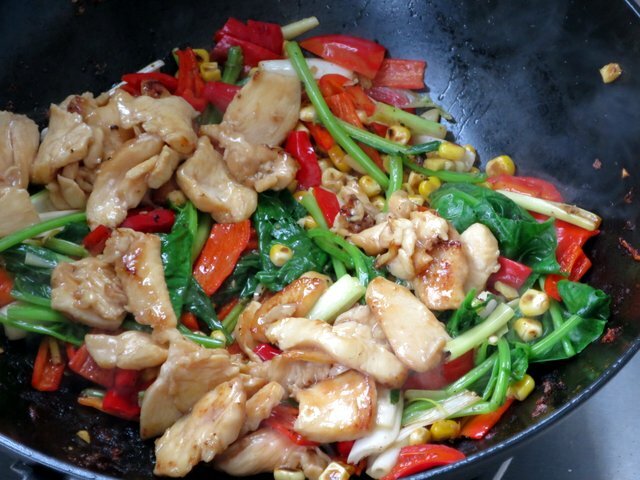 The same overall cooking method is applicable to all stir-fry dishes. Good point, Lips. And absolutely true. One generally starts with the meat, and when done, reserves it off to the side while cooking the vegetables rapidly over high heat. Then add back the meat near the end. The main thing that keeps these simple stir fry dishes from becoming boring is the way the marinades and condiments can be varied to compliment the main ingredients. Plus an imaginative choice of those main ingredients themselves, with an eye to harmonizing textures as well as flavors and colors, can help the dish be lively and interesting. Most of the time I try to select fresh ingredients that are in their prime; especially vegetables that have hit peak season. The seasons here can sometimes be short, but they are so very bountiful that it's nearly criminal to ignore them. What I was hoping to do with this current post was to encourage people to try using Chinese-language recipes in order to achieve more authentic results. Maybe start some discussion of other real-China cooking materials and methods. When I look up Chinese recipes on the English-language internet, I often get things that are very different from what I would ever be served in an unpretentious, home-style restaurant here on the Mainland. You have no idea what bizarre stuff tries to pass for Chinese food in Texas, where I am from. So I had two goals this time around: promoting the use of native-language recipes, and secondly showing folks how to make this simple, tasty one-dish stir-fry meal. Beautiful post, abcd! Sadly, I am a vegetarian so cannot try it out, but I think such lessons are valuable for Chinese learners to study. Wish my Chinese textbooks possessed such chapters. When you discover recipes, do you usually use Chinese-based media, or friends, or? Appreciate your kind comment, Alex_Hart. When I discover a new recipe it's usually triggered by a suggestion or request from a friend who is coming over for a meal or a vendor at the wet market that I've asked how to best prepare the ingredient he or she sells all day long. I consider these vendors de facto experts on their particular food item. And every now and then I'll try something in a local restaurant that I like a whole lot and want to try to reproduce at home. But the second phase of working out a new recipe, once I've decided what I'd like to try to make, is to research it on the Chinese internet. I do a Baidu search and then study three or four variations on it. I synthesize them and boil them down, taking what look to be the best parts of each, then try out the result in my kitchen, keeping in mind tips that I may have learned directly from the sellers in the market or wise, experienced local friends. At that point I'm generally able to make small modifications and adjustments to improve it, given my ready supply of fresh local ingredients. Recipes that really turn out great usually showcase a single item harvested and purchased in its prime. If the dish comes out real good, then the next time around I make photos and share the process here on the forum. I want to be sure the meals I post here are reproducible, and not just a one-time lucky fluke. So thanks again for asking. When you move to Hangzhou, you will probably be able to do something similar, enjoy the process, and post the results here for the benefit of others. I've had mixed results myself with English language Chinese recipes, including from such icons as Dunlop. Looking forward to being fluent enough to read Chinese language recipes! Agree with you on the local merchants as being experts. Just like you look for a restaurant with a line of locals, you should trust those same locals to know how to make their ingredients shine! 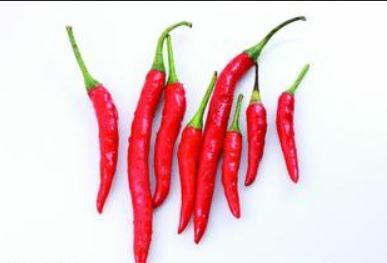 Do you find Chinese recipes suffer from spice deficiencies? One thing that has always driven me insane is my inability to trust English recipes for their spice (and other flavorings) measurements. Dunlop's spicy SIchuanese dishes are one example, as they never seem to get even halfway to the temperatures of Chengdu dishes. This not only applies to things like chillis, but also to soy sauce and other ingredients. This is true when I use American or European recipes, too, but has always been a particular obstacle in making Chinese dishes as I haven't figured out the palate yet. 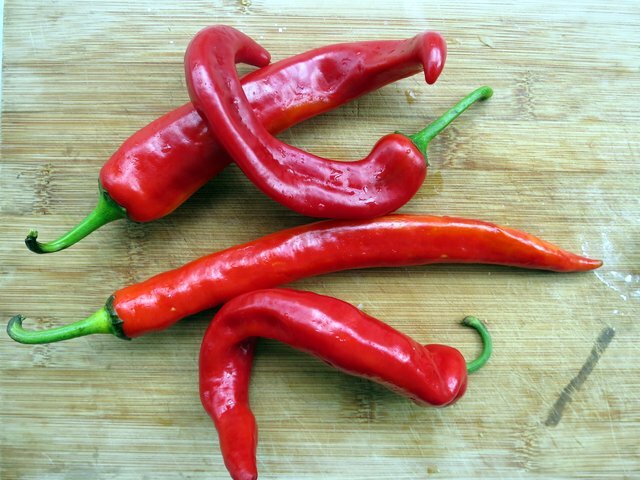 Do you find Chinese recipes suffer from spice deficiencies? One thing that has always driven me insane is my inability to trust English recipes for their spice (and other flavorings) measurements. To be honest, that's something I struggle with too, even here using Chinese recipes. The best way I've found to get a handle on it is to watch someone who is an old hand in the kitchen and then imitate. What they usually do is taste as they go along and adjust the seasoning on the fly instead of relying on precise initial amounts. They will also often say, "A little more or less hot pepper is OK, but whatever you do don't over-salt it." Or something along those lines. Lets me know what's critical and what's not. I've also been surprised that some Yunnan recipes call for very simple flavors with minimal seasoning (in order to let the main ingredients shine) while others call for several dense layers of spices applied on top of each other. The complexity of the desired taste varies a whole lot. And finally, there's no substitute for having eaten that dish several times before and having attempted making it previously with varying degrees of success. Many of the recipe that I post here are ones that I have messed up the first time or two I tried. Then made adjustments and corrections until I got them pretty much right. Agreed, there is no substitute for tasting! I suffer from over zealous tasting while I cook, but my problems always arise when I try to create a recipe that I've yet to try, or that I'm not sure about cooking. This is especially problematic with something like curry or stews which often mellow out or transform after cooking for awhile. I've taken to doubling or tripling spices and such, but there is always the worry about imposing my own taste profile on a dish.